Launching on September 25, the Sustainable Development Goals (SDGs) will call for no less than an end to poverty, hunger and malnutrition by 2030. This is welcome news--and for the nearly 800 million people worldwide who will go to bed hungry-- long overdue. To get there, it’s not just about raising yields. It’s also about managing risks to protect the most vulnerable. Along with gains in productivity, we also need more resilient agricultural systems. Failing this, unmanaged risks will upend the road to 2030. Climate change only ups the ante with promise of increasing weather extremes and new and more virulent pest and disease outbreaks. Editor’s note: Kalyan Panja was the grand prize winner of our first Spring Meetings blogging contest. His winning post covered two events related to food and agriculture. 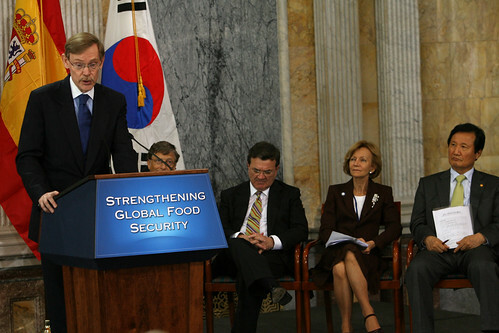 His prize was the opportunity to interview Ethel Sennhauser, the World Bank’s director of agriculture. What is the most striking crisis in the agricultural sector that needs to be addressed urgently? The world needs to feed 9 billion people by 2050 — but climate change, declining soil health, and overstretched resources could drive down agricultural productivity in the long run. Droughts and extreme weather events are already having a negative impact on farming and productivity. In the future, yields could drop by more than 25%. As we mark World Food Day, here’s a sobering thought: Too many people are hungry. One in nine people suffer from chronic hunger, more than 1 billion people are undernourished, and 3.1 million children die every year due to hunger and malnutrition. This is a huge drain on development--when people are hungry and malnourished, they are less able to improve their livelihoods; adequately care for their families; live full and healthy lives and lift themselves out of poverty. The problem is set to intensify in the future, as the population grows, climate change affects how we produce our food and the natural resources that help feed the world are stretched even further. We aren’t feeding the world as well as we should be in 2014. How can we do better in the future, when the world will need to feed and nourish 9 billion people in 2050? The world has made impressive progress against hunger in the past few decades – mostly due to the hard work of poor people themselves. They are the most important stakeholders: Who could be more invested in the struggle against hunger than a young woman with a hectare of land to farm and two children to feed? The State of Food Insecurity in the World (SOFI) 2014 tells us that the hunger target of the Millennium Development Goals (MDGs)—cutting in half the proportion of undernourished people—is within reach. Even better, the evidence shows that the world is making progress rapidly enough to end hunger by 2030. Setting and achieving a goal to end hunger and malnutrition in the post-MDG, post-2015 era can bring an end to widespread chronic hunger, which affects more than 800 million people today. Ending hunger is important for the present and the future. It is far better to prevent a crisis than to respond after it has occurred. Ironically, people living with hunger are, by and large, the very same people the world needs to feed a growing population. Smallholder farmers often face structural barriers to food security—for example, they lack access to basic infrastructure, such as roads to get crops to the market, storage facilities, electricity, and irrigation. They lack access to credit and land. Helping them increase their incomes and build assets, strengthening safety nets, and focusing on health and education outcomes will help build their resilience to shocks that are beyond their control, such as climate change-related weather events. Globally, 165 million children under age 5 suffer from chronic malnutrition – also known as stunting, or low height for age. Much of this damage happens in pregnancy and the first two years of a child’s life. It means a child has failed to develop in full and it is essentially irreversible – which means that the child will have little hope of ever achieving her full potential. The evidence tells us that malnutrition costs lives, perpetuates poverty, and slows economic growth. We now know that nearly half of all child deaths globally are attributed to malnutrition. I have seen in my own country, Indonesia, how stunting caused by malnutrition has diminished too many children’s futures before they even begin. Malnourished children are more likely to perform poorly in school and drop out earlier than their better-nourished peers, limiting their future earnings. Data from Guatemala show that boys who had good nutrition before age 3 are earning nearly 50% more as adults, and girls had a greater likelihood of having an independent source of income and were less likely to live in poor households. Malnutrition diminishes not only the futures of individuals, but also of nations. Recent estimates suggest that as much as 11% of gross national product in Africa and Asia is lost annually to the impact of malnutrition. To end extreme poverty and promote shared prosperity, the world must commit to end child stunting due to malnutrition. I will be joining leaders from around the world in London this week to focus on this critical challenge. Our villages are bread baskets – the primary region where most of the world's food is grown. Ironically, they are also home to many of the 1 billion who live in chronic hunger. Higher food prices are again a concern as the World Bank and IMF head into their Annual Meetings. In the last several months, volatility in the price of wheat has been reminiscent of the kinds of market movements that occurred during the food price crisis of 2008. While that volatility has decreased somewhat, the World Bank Group is asking the World Bank Board of Directors to reinstate its food crisis emergency fund – the Global Food Crisis Response Program (GFRP)--so the Bank can be ready to respond quickly again if needed. The $2 billion program provided support for policy change, social safety nets and agricultural inputs to boost food production in hard-hit countries. The longer term worry, of course, is food security, especially in light of a continued higher food prices, underinvestment in agriculture in the last decade, and changing weather patterns related to climate change. The Bank Group increased agricultural assistance last year to $6 billion, and will likely keep lending in the $6 billion to $8 billion range for the next several years, as recommended by our Agriculture Action Plan (pdf) for fiscal years 2010 to 2012. The plan calls for increased investments in agricultural productivity, especially in areas of Africa where the land is suitable and farmers currently struggle to make a living.